George Risk (GRI) is a holding I've had for a while that I originally picked up as a net-net and have continued to hold as the business has recovered. This probably won't be a very long post because GRI is a very simple company. The company was founded in 1967 and is located in Kimball Nebraska they are what I would consider a public private company. I say this because Ken Risk the CEO owns 58% of the company and runs things like a small town operation. The company is small, with a market cap of $32M, here is their facility in Kimball. The company makes small electronic switches and sensors, additionally they also make pool safety sensors. The company states that 88% of their revenues are from the security alarm segment. The security segment has over 4,000 customers of which 42% are sold to through one distributor. This is one of the biggest risks I see for the company, the loss of the distributor. The company states that they feel safe with the distributor because they have had a good working relationship for years. While this sort of thing might fly out in Kimball NE it doesn't exactly give me a warm fuzzy feeling. The good news is GRI and the distributor have a 3 year agreement in place outlining purchasing terms, prices, product delivery schedules and terms for termination. This agreement is found in the SEC filings here. The big items to note is the large amount of cash, and the $19m securities portfolio which is a net $4.72 per share or 73.8% of the current market value. The portfolio is managed by an advisor. The equity holdings are split across the following types of mutual funds, growth, growth and income, and foreign stocks. I'd love to know where exactly the money is invested as the equity portion has stayed between flat and a slight loss since 2009 which is a bit surprising. 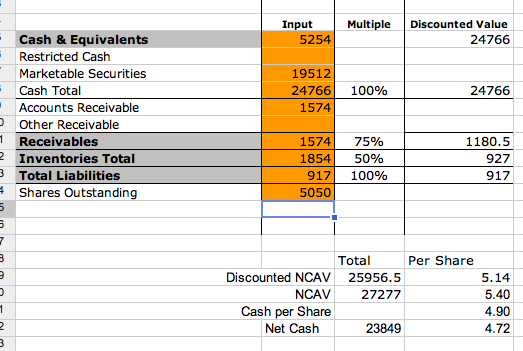 With a company trading with a large amount of cash and close to NCAV the presumption would be that the business is in the dumps with little hope of recovering, in actuality the opposite is true. -47% gross margin, 19.9% operating margin, 22.8% net margin. -ROIC of 39%, this is incredible but keep in mind the company can't continue to invest at this rate which is why they've built up a stash of securities and the fixed plant has remained stable. GRI earned $.40 per share in 2011 (April 2010 -April 2011) verses $.30 a share in 2010. Part of net income is derived from dividend and investment income. The business took a hit when the housing market crashed but has recovered nicely. I think the simplest way to value George Risk is a simple cash plus earnings power. -As stated above GRI has a distributor who accounts for 42% of sales, losing this distributor would impair the business. -Ken Risk the CEO owns properties which the company leases from him. In addition the company leases a small plane from Ken. While the amounts are small and everything seems above board it reinforces the impression that management is running the company as a family operation. -The stock is illiquid, it goes days without trading. -The marketable securities could be mismanaged destroying a valuable portion of the NCAV. I wonder aloud why if the company hasn't done anything with this huge excess on the balance sheet already, why will it act shareholder friendly in the future? I always vacillate between the opinion that such a balance gives shareholders an opportunity to receive an unexpected windfall or increases the likelihood that management acts like morons. Have you been able to find out who is advising them if that is even possible? It's definitely quite cheap, although it's less clear why the situation exists compared to SODI. Why can't I find this companies SEC filings? For some reason if you search by ticker or by "George Risk" they don't come up. In EDGAR search under "Risk George" and you'll get the filings. Someone needs to sanborn map this!